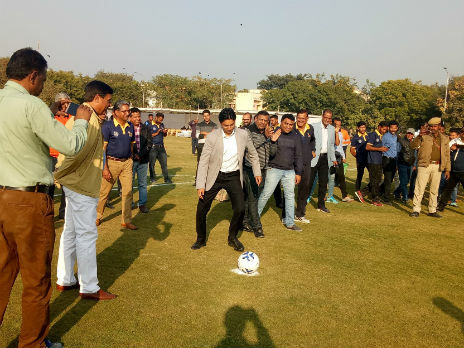 Udaipur: Hindustan Zinc sets-up up India’s first, below 12 years, international level residential ‘Hindustan Zinc Football Academy’ in Udaipur. The Academy is going at the grass-root level to select 40 talented & aspiring footballers, to nurture & train them as professional players. In order to penetrate in rural and tribal areas, the Academy is also organizing 64 Community Football Clusters in 5 identified districts of Rajasthan that will nurture 2500 football enthusiasts through camps to form a 20 players team each of girls and boys at each Cluster. So far, the Academy has shortlisted 56 children through 23 Talent Scouting Camps that saw the participation of over 3000 children from 5 districts of Rajasthan – Udaipur, Bhilwara, Chittorgarh, Rajsamand and Ajmer. These identified 56 children have now joined the 24-days Residential Team Zinc Football Camp at Chittorgarh starting from 10th January, 2018. This Residential Camp was inaugurated by Collector of Chittorgarh – Shri Inderjeet Singh. Post this camp, based on the performance, merit, physical, mental & psychological attributes, the Academy will further select atleast 20-40 children who will join Residential course of Hindustan Zinc Football Academy in Zawar, Udaipur. At Academy, these children will undergo rigorous training to become professional football players and play in various Local, National and International football tournaments. Their training and grooming would be monitored by experts that would include health & fitness experts and nutrition & diet experts. Their skills, body weight, energy, strength and stamina would be tested and monitored on regular basis. For Skill Development and also to create a pool of talented, knowledgeable & licensed Football coaches, Hindustan Zinc has organized All India Football Federation (AIFF-D) License Course at Nimbaheda, Rajasthan from 2nd – 6th January, 2018. 24 Football Coaches participated in this 5-days program and were trained in various techniques and methodologies of professional Football coaching under the guidance of All India Football Federation Instructor (AIFF) – Mr. Keshav Dutt. These Coaches will now be responsible for 64 Community Football Clusters and will provide regular training & fitness sessions to its 2500 football enthusiasts. The Company is confident that some of these players will have the potential to be selected for the national football team and clubs and would also be eligible to participate in international football tournaments. The ultimate objective is to reach out to more than 60,000 children in 100 villages and tribal areas of Rajasthan in next five years.